← I want to ride my bicycle….Bi-cycle! Sunday was a great day. The temperature was above freezing for the first time in weeks, I had a free day to spend with my sweetie, and no obligations. What did we do? 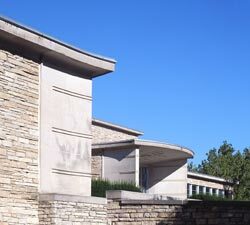 And watch this… The Des Moines Art Center is a beautiful museum, the building itself is a masterpiece, designed in three stages by architecture Giants— Eliel Saarinen, I.M. Pei, and Richard Meier. On Friday, a new exhibit opened featuring American Regionalist artists from the Depression era, most notably, Iowa native, Grant Wood. 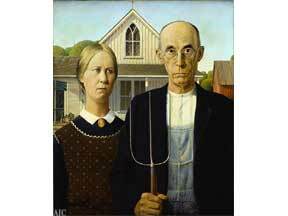 His most recognized work of art, American Gothic, has returned home to Iowa for a limited engagement. There are works by Thomas Hart Benton, Margaret Bourke-White, and other early 20th Century geniuses…the exhibit is wonderfully done and incredibly thorough. Best of all, other than the $10 we spent in the Gift Shop, the day was entirely FREE! In the evening, we chilled out by watching Sense & Sensibility on Iowa Public Telelvision. I love that my sweetie would rather go to an Art Museum and watch artsy films with me than sit and watch a silly ol’ football game. Ahhhhh….life is good. Seriously, if you are anywhere near Des Moines in the next three months, you really should visit the Art Center and take in this exhibit. That sounds like an awesome exhibit. Would you believe I’ve never been to the art center. I’ve lived here for decades.